Be the first to share your favorite memory, photo or story of Mary Alice. This memorial page is dedicated for family, friends and future generations to celebrate the life of their loved one. 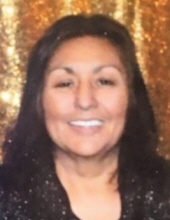 Mary Alice Castillo born June 16, 1955 passed from this life on February 1, 2019 at the age of 63 years. She is preceded in death by her parents, Antonio and Olivia Cadena Munoz; and her brother, David Munoz. She is survived by her loving husband of 39 years, Richard A. Castillo; her children, Angela Marie Guerra, Anna Marie Castillo, Adriana Renee Guerra Castillo, Alexis Ariel Guerra Castillo, Adrian Ricardo Guerra Castillo, and Alexander A. Guerra Castillo; her only grandchild, Aricela Marie Gutierrez; as well as numerous nieces, nephews, other relatives and dear friends. She will be greatly missed but never forgotten. To send flowers or a remembrance gift to the family of Mary Alice Castillo, please visit our Tribute Store. Or, if you would like to donate to the family, please visit Mary Alice's Tribute Fund. Help ease the financial burden placed on the Castillo Family after the loss of a loved one by making a donation. "Email Address" would like to share the life celebration of Mary Alice Castillo. Click on the "link" to go to share a favorite memory or leave a condolence message for the family. Provide comfort by sending fresh flowers from our local florist or donating to Mary Alice's Tribute Fund.